« Should The Music Industry Be Saved? The Falcon MVIX is a new drive enclosure that loads your media files via Ethernet or WiFi so you can view them on a HDTV. It’s a hard drive enclosure, so you can add your own IDE or SATA hard drive and use it to store your media files. In other words, it looks like Apple TV for tweekers. The MVIX supports all commonly used media formats, and virtually all of the more specialised ones too. 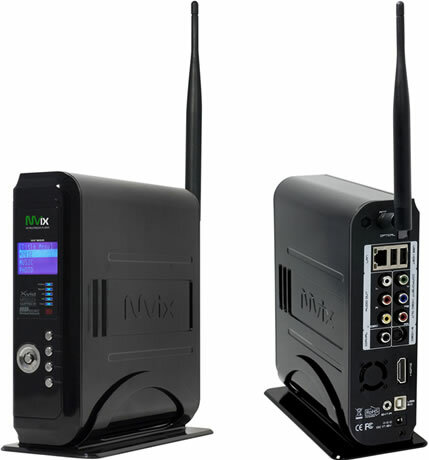 It has no problem with MPEG-1/2/4, VOB, WMV 9, DivX and Xvid video files and will also happily play MP3s, WMAs, AAC, Ogg or WAV and AC3 music files. The Falcon MVIX Media Centre will be available from Thumbs Up starting April 10, 2008. The suggested retail price is set to Â£199.99 (about $395 UDD). Where’s my upconverting DVD player with USB slot and H.264 playback capability? I’m tired of converting every video podcast to DivX just to watch it on my PC.